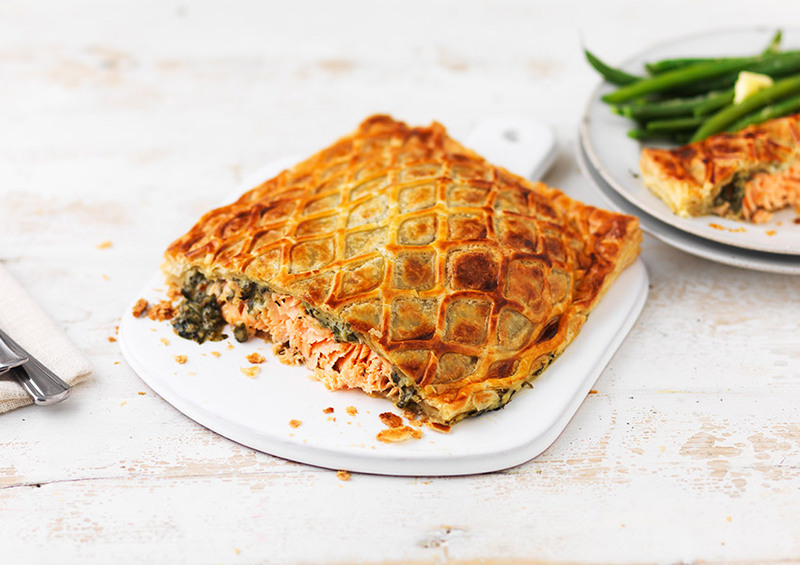 Filled with responsibly sourced Scottish oak-smoked salmon and vintage Cheddar sauce, this butterfly puff pastry en croûte is best served with new potatoes or a fresh green salad. Smoked Salmon (42%) (Salmon (Salmo salar) (Fish), Salt), All Butter Puff Pastry (39%) (Fortified Wheat Flour (Wheat Flour, Calcium Carbonate, Iron, Niacin, Thiamin), Butter (Cows' Milk), Water, Salt), Spinach (5%), Cows' Milk, Double Cream (Cows' Milk), Cheddar Cheese (Cows' Milk) (1%), Fortified Wheat Flour (Wheat Flour, Calcium Carbonate, Iron, Niacin, Thiamin), Butter (Cows' Milk), Lemon Juice, Parmigiano Reggiano Cheese (Cows' Milk), Cornflour, Fish Gelatine, Chives, Lemon Juice from Concentrate, Salt, Fish Powder, Chicory Extract, Yeast Extract,Water, Onion, Mustard Flour, Rapeseed Oil, Celeriac (Celery), Sugar, Wheat Flour, Leek, Carrot, Yellow Mustard Flour, Acidity Regulator: Citric Acid, Turmeric, White Pepper, Bay Extract. Produced in United Kingdom using Scottish salmon.